Designed to expand the dimensions of CT, Aquilion LB combines Canon’s award winning CT technologies with the advantages of a large bore platform. Aquilion LB provides you a true, industry-leading, 70 cm field-of-view (FOV) acquisition, covering more anatomy with greater accuracy than ever before. Aquilion LB also features a tremendous 90 cm wide bore for easy patient positioning and for increasing diagnostic anatomical coverage resulting in optimized diagnosis and treatment. 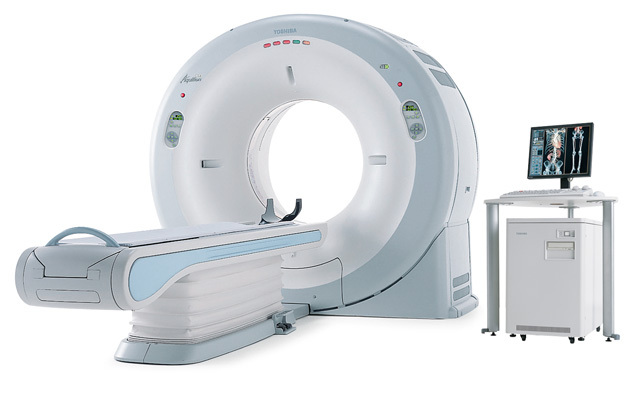 The 16-detector row / 32 slices Aquilion LB CT system delivers routine low-dose scans for each patient in a wide variety of clinical examinations. CT simulation is a procedure used during the treatment planning stage to identify the exact location and size of the area that needs treatment. Aquilion LB is specifically designed to meet oncology challenges and improve patient care. Now CT simulation positioning can easily mirror radiation therapy positioning without compromise.